If you have an elderly family member who lives on their own, and you would like the peace of mind that comes from knowing that they're doing OK, then you should consider installing the BenignEye Intelligent Monitoring System. The BenignEye System has a unique self-learning capability and spends the first 30 days observing how your loved one moves around the house and interacts with the appliances within it - things like how many times they put the kettle on and whether there is a pattern to this (there usually is), how often and when they open the Fridge, how often they go up and downstairs, how long they normally sit in their favourite chair etc. Having determined what normality looks like for any one individual (whose pattern of behaviour is unique to them and doesn't have to look like anyone else's), BenignEye will then alert you by SMS and/or Email if something isn't quite right....perhaps Gran got up later today and didn't make herself a cuppa at the usual time, or perhaps she was just less mobile than usual. Once you know, you can give her a call and check all is OK.
BenignEye can also protect the monitored individual by automatically turning off the curling tongs if she has left them on, or warn you that the temperature of the house is too low in the winter. You have a massive amount of choice regarding how many sensors you want to include in the system and can choose up to 232 sensors (we doubt anyone will need more than 6 or 7 but it's comforting to know that you will never outgrow the system). Typical sensors include a number of motion sensors (how many will depend on the size of the house), with perhaps a 'smart-plug' to monitor when the kettle or toaster is used, plus a door-switch on the Fridge. If you wanted to put door switches on the front and back door, that's not a problem. Installation is super-simple and needs no special skills or experience. Just position the sensors, plug the 'box-of-tricks' in and it will talk to you by sending emails to your mobile phone. It will invite you to test each of the sensors in the system and it will send you an email every time one of the sensors is triggered so you know it's working OK. (Don't worry, it only does this for the initial set-up period of 10 minutes then it will stop). Once you've seen them all fired, it's up and running and you don't need to do anything else. A Time-In-Attendance module is planned, which means that you can be told when certain visitors (perhaps health or social care visitors enter and leave the house). The system can be fitted with a battery back-up system which means that you will be told if there is a power cut. This is important on two counts, first the BenignEye system will close itself down elegantly and secondly, it will not be operational until the power comes back on. The system will tell you when any battery powered devices need their batteries changing. Real-life is the inspiration for the BenignEye system. 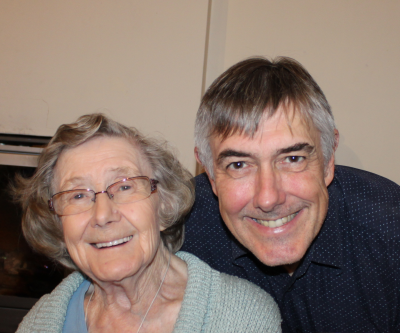 Sadly, my Mum passed away in February 2016 but was still living independently at 90 and doing remarkably well considering - she was profoundly deaf and registered as partially sighted due to AMD (Age-related Macular Degeneration). 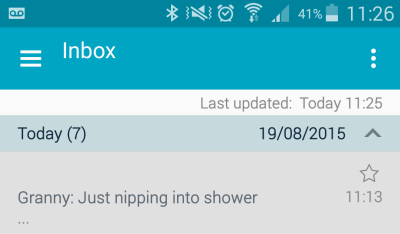 I started with a simple tablet based messaging system so she could tell me if she was going in the shower (which explained why she might not answer the phone) which might otherwise mean I was worrying over nothing. This came through as an email on my smartphone and it progressed from there. BenignEye monitors the data coming from all of the sensors in the house and compares it with any pattern(s) it has seen previously. 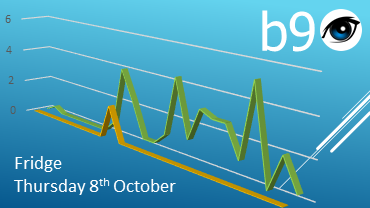 If there is significant variation between the current behaviour and what has previously appeared to represent normality, then it will communicate this to you by email. The BenignEye system is state of the art and unlike anything which has previously been available, due to its advanced self-learning algorithm which means no user configuration is necessary. It determines for itself what normal behaviour looks like for any one individual in their own home and uses that as the basis for alerting a concerned family member if anything significant should change. The BenignEye system represents excellent value for money, by utilising standard Commercial Off The Shelf (COTS) components in an innovative integration of systems. 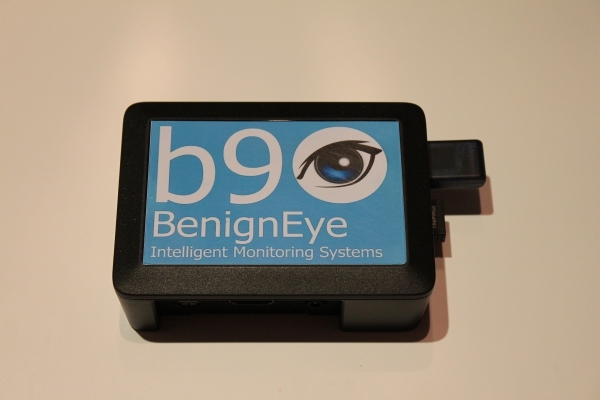 BenignEye is completely flexible with regards to the number of monitored devices and device type. Mix and match between smart-plugs, PIR motion sensors, door switches, temperature or flood sensors, floor or chair pressure mats etc and with a portfolio of over 1000 approved products, you have an unrivalled degree of choice. You can add devices at any point in the future should your requirements change or you just wish you had bought more in the first place. Smart-plug. Just plug it in and then plug the device you want to monitor (such as a Kettle or a Toaster) into it. Sorted!